You can check out Jackie’s blog post at the following links…She discusses the techniques she used to make her post card. 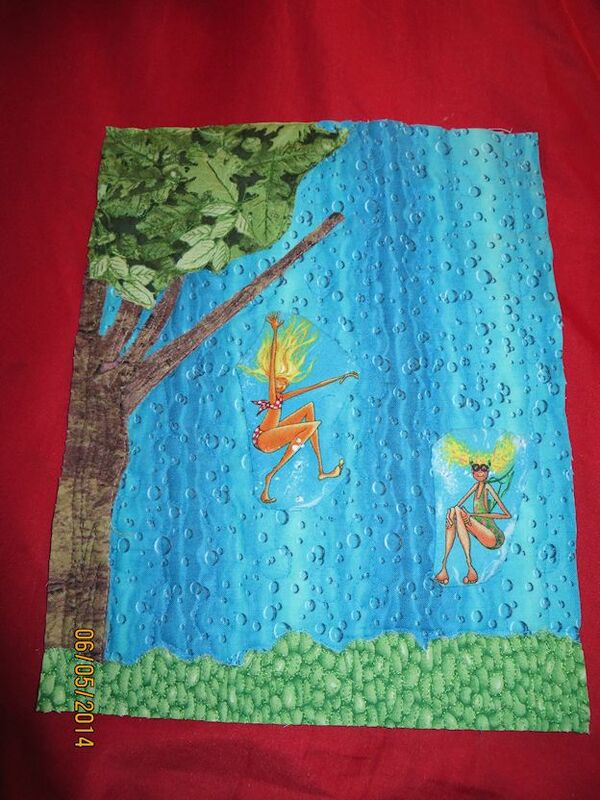 I have been waiting for Jackie to post her blog about creating her piece of HEXIE ART. I was amazed at how small these HEXIEs are… less than an inch in size. I love the couching technique and have never tried that before… I have a couching foot for my machine so I think this is something I would like to do. I love the colors that Jackie selected for her back ground. . This is the cutest postcard ….. I have plans for it to go in the hallway once I have finished painting and the new flooring is in. I am thinking of creating an entire wall of postcard small pieces created by my friends, and myself. Right now it will be pretty lonely so I will put some stuff that I want to replace back up … but if I join future postcard exchanges and on line bees plus make some of my own … that wall will fill up fast. MY POST CARD EXCHANGE for Quilt Cabana . . . RIGHT CLICK on any of the photos and a new open window will to a larger photograph. On a whim I joined Sandi Colwell’s from Quilt Cabana’s blog, post card exchange . A while back they started a quarterly exchange. I had seen the postcards on twitter and I thought it looked like a lot of fun. I thought this would be an excellent opportunity to use techniques I wanted to try out but did not plan to make an entire bedside quilt. I figured this would give me a break from some of the other long term projects I have going on. But being me I put some PARAMETERS on the project. ( You will notice I am not calling them rules) In part I need the rules to keep me in check as I do tend to get carried away with projects.. They start small then they explode into huge. Project must be done equal to the time frame of one afternoon. I might spread the work over several sessions but I was not to spend more than 4 to 6 hours. I plan to try any of the various techniques I have been seeing on DVDs, the internet and in book. I have a huge collection of quilting DVDs. I buy them, I watch them but have rarely tried any of the techniques. I own all the Quilt in a Day, FONS and Porter series, some Quilt Arts and all of THE QUILT SHOW. There are wonderful lessons and videos I watch them all the time… but now was a chance to get busy and see what techniques I like. Hopefully when I get finished with this current round of quilts I will be able to use the new techniques I learn into larger projects. I want to honor my past and my home state of MICHIGAN. The subject of my projects will be reflection of my life here and what makes MICHIGAN special. My postcard will reflect the current logo …. PURE MICHIGAN. When I was young my parents could not afford to take us on vacation. I was about 13- 14 years old when we took our first vacation as a family. We rented a northern cottage and spent a magical week swimming, lazing and having fun. My sister and brother were much more adventuresome as there was a tree with a rope that could be used to swing out and drop into the lake. They used it right away but it took me till the last day of our vacation to swing out on a rope to drop into the lake. … but I did it even thought I was afraid. My postcard partner is Jackie from SEW EXCITED QUILT Blog. The post card is on the way to her as I write and pictures of everyone’s postcard can be found on the FLICKER GROUP set up for the exchange. My pictures and this blog will not be posted until I am sure that Jackie got my project in the mail. I would like to say as usual the project exploded on me. I originally planned a simple post card but because of the motifs I selected I had to enlarge the size in order to maintain the proportions of the piece. I started setting up my backing and batting. I also included a sheet of RICKY TIMS STABLE STUFF as stabilizer for the thread painting and free motion quilting. 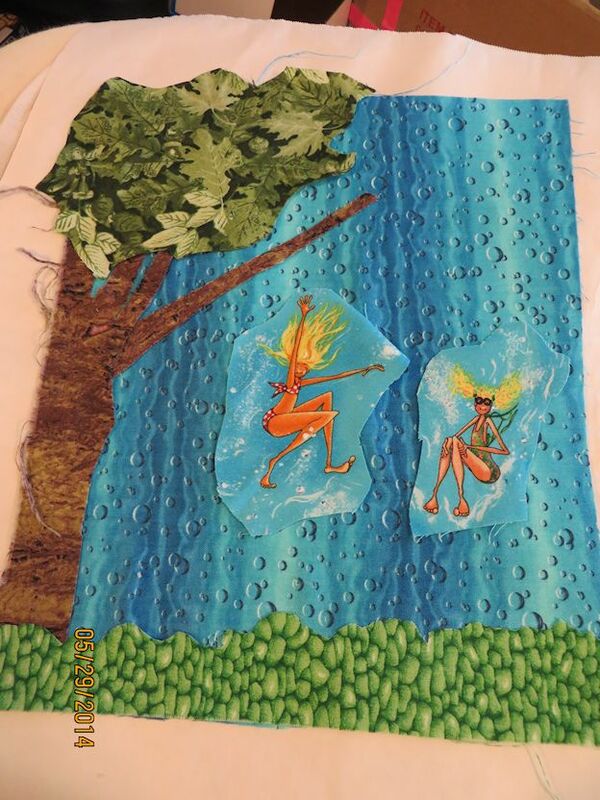 I started by layering the fabric to make the background design of the tree, ground and lake. I raw edge appliqued the various layers. I had raw edge appliqued before but not in a long time. I think this time I did a better job with the applique. I then free motion quilted the background. I ran into trouble when I tried to FMQ the leaves on the tree. I had already FMQed the ground and the water elements but my machine kept skipping stitches when I tried to FMQ the tree section. At first I thought it was because of the basting spray I had used to sandwich the fabrics. I later realized I had too many layers of fabric in this section of the piece. 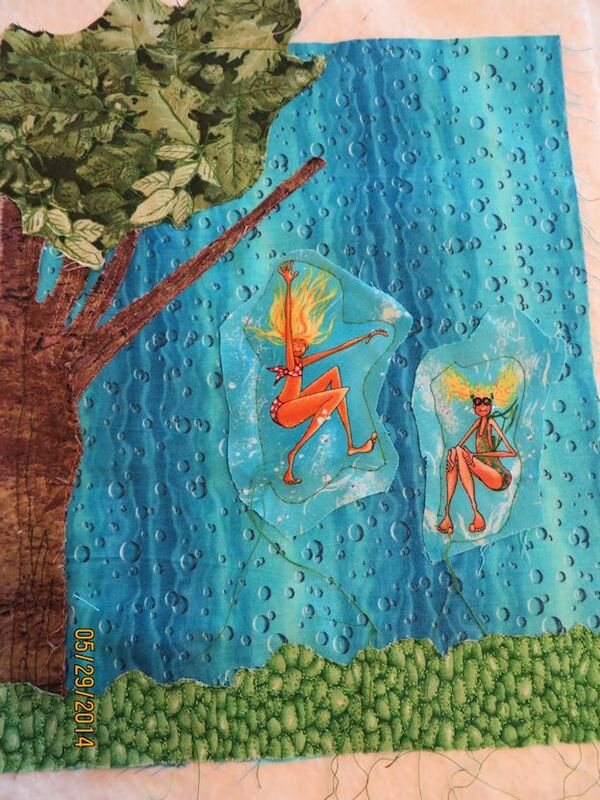 I had applied the leaf fabric over the water and had not clipped out the excess fabric. There were too many layers of fabric to FMQ the top thread was not able to connect correctly with the bobbin thread. I have learned my lesson and will trim out my applique in the future. 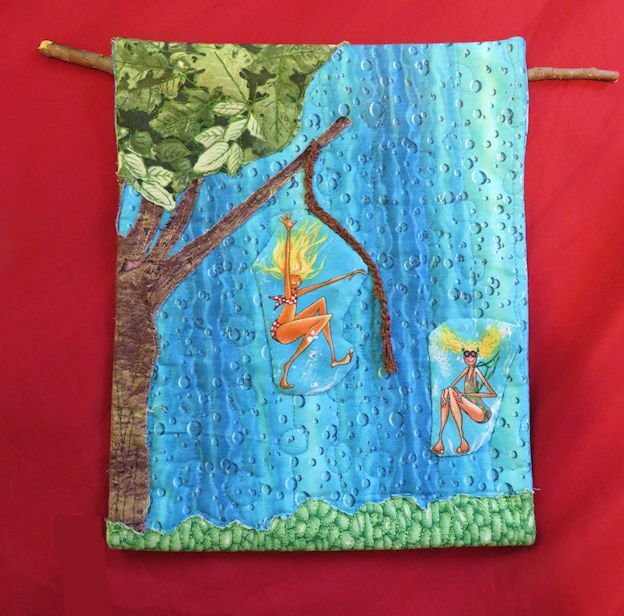 I used HAND applique technique called BACK BASTING to secure the swimmers to the water background. It was a new hand applique technique to me and I think I like it enough to use it in the future. I used this piece to test out some techniques I hope to use on a larger piece. The final technique I used was the framing instead of binding… as you can see I still have to improve on that technique. I have tried several methods I viewed in DVDs, Craftsy and on YOU tube but none of them work very well. I need to learn how to handle the bulk in the corners better. I am posting pictures of the various steps I used to make this piece. Well this is all there is to the tale of my SUMMER POST CARD. I will be posting Jackie’s post card in a future blog. Join us on twitter and join the next post card exchange… it is a lot of fun and can be a challenge. At first glance I thought the second edition book was a repeat of the first edition. 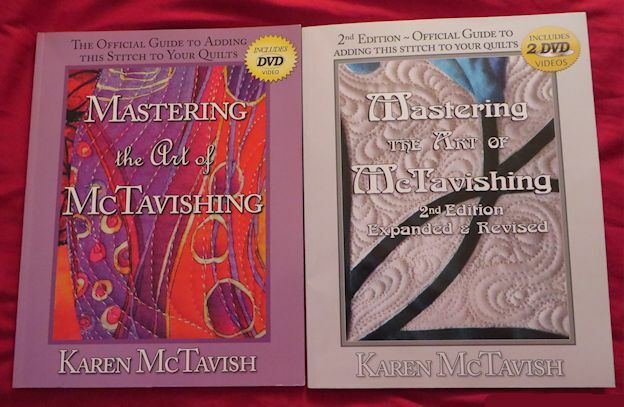 I then went through the books page by page and realized that Karen has updated and added a lot of new material as well as a lot of new pictures of quilts and examples of McTavishing. The addition of a second DVD with more demonstration and instruction by Karen is worth the cost of the book. I have already watched the DVD twice and have been practicing several new motif I have not seen before and want to add to arsenal of FMQ motifs. The only MINOR complaint I might have with the book would be that I wish they had re-shot the pictures for BACK GROUND FILLERS. The motifs are so much fun and new pictures could have really highlighted with better picture. But that is my preference, on the whole the book and dvds are excellent and worth being added to my reference shelves. DISCLAIMER: I got a bunch of free magazines and books from my quilt shop friend. I am only mentioning this as I do not want anyone to think I am getting any money or sponsorship because I have been posting so many reviews lately. Anyways I did make out like a bandit got some really good magazines and a stinker…. I am going to be reviewing magazines in an entirety rather than individual issues. FIRST off a couple of years ago I stopped subscribing to almost all my quilting magazines… they were so redundant and many of the quilts displayed in them besides being uninspiring were downright UGLY quilts. Most of the quilts shown were a mishmash from the same fabric collection and I considered them more advertisement for fabric companies then quilts I would want to make. The quilts lacked contrast, spark and focus, further more I saw the same quilt blocks being used over and over again… stars and monkey wrenches showed up repeatedly in all the magazines. 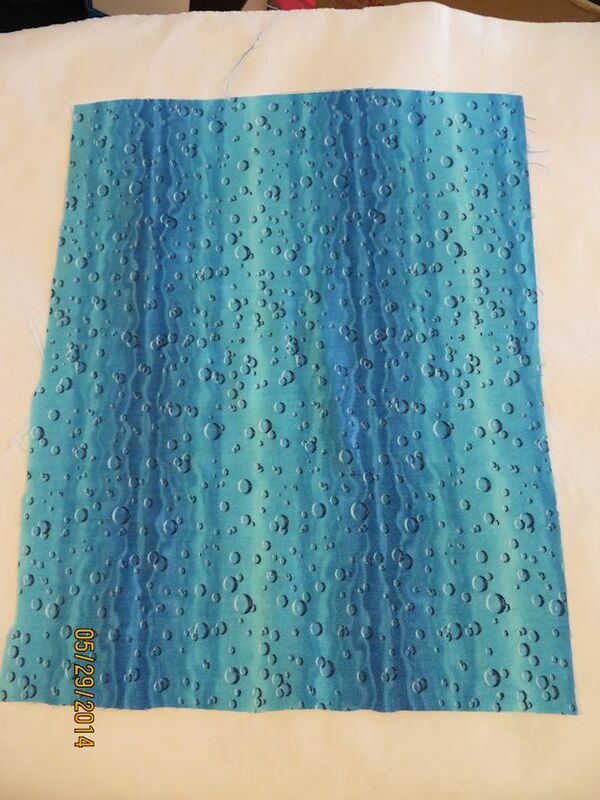 WITH over 4000 known quilt blocks couldn’t the editors insist of different block patterns? Since I save patterns and pictures of quilts for inspiration I found I was throwing out / giving away more and more magazines and keeping less and less patterns or pictures for inspiration. I also found I became a big PINTEREST USER and enjoyed the less clutter from getting rid of the magazines. Consequently I dropped all my magazine subscriptions. The only one I have kept for the last three years were FONS AND PORTER LOVE OF QUILTING. I would get the subscription as part of a package every time I bought a series DVD. I have recently subscribed to MACHINE QUILTING UNLIMITED which is actually for long-armers but has a lot of really good information about sewing machines, threads, batting etc. So far the majority of what they discuss in the magazine can be applied to my domestic machine quilting. I am going to maintain my subscription for a couple more years. I like the new line of magazines that FONS AND PORTER are producing. I am finding I have less and less time to quilt so I want simpler patterns. I have also gotten away from the styling in the flagship magazine LOVE OF QUILTING … those quilts tend to be template heavy, F&P product heavy and very traditional and retro in their styling. They use a lot of Civil War and reproduction fabrics in their quilts. They occasionally have more contemporary fabrics but even then the pallets are more mature and muted in styling. Maybe because I had the magazine for over 10 years I am bored by it. My quilting style has changed and evolved over time and yes I enjoy antique quilts but usually not in my home. I will recommend this magazine to those people who like traditional style of quilts. The lessons in the magazine are well written and easy to understand. I always thought I got my money’s worth from the magazine. I did and do save a lot of their patterns for someday use. I do love their new magazine lines QUILTY, QUILTING QUICKLY, and EASY QUILTS they reflect a more modern ascetic . I see fresher, more innovative styling to the quilts. I do not see a repeat of the same blocks and patterns. I had to make a series of baby quilts last year and those magazines were a gold mine of ideas, pattern and yes even instruction. Much of the techniques and instructions come from the parent magazine LOVE of Quilting. I recognize the writing styles and the articles. After all how many ways can you make half square triangles? ( ANSWER: over 16 methods) These magazines are also F&P product heavy but for some reason I do not seem to mind as much. Probably because I have found so much other useable information in the magazines. I feel I am getting my money’s worth. I have made a large number of these patterns when I need to make fast gifts. I find I have been saving these magazine intact for many years, usually I rip out what I want and toss the rest in my annual purge. These magazine are saved from that fate… so far. One magazine I found I think you should not buy as it was not worth the money and it is very expensive ( $11.99 American for less than 100 pages) was PATCHWORK and QUILTING, Sharing your Passion for Fabrics, an English publication. I read three of the issues. The magazine is advertisement heavy, pattern and article light, did not have much substance. There were 6 block / quilt patterns, the rest of the projects were purses, and softies. There were 5 pages devoted to fabric collections but I consider that advertisement and of no use to me because I only buy from local quilt shops. ( HAVE to touch the fabric to love before I buy.) I did not see anything different or special about the ascetics of this magazine and you get more bang for your buck from other magazines. I have several issues of INTERNATIONAL, IRISH and French ( English version) Quilting magazines from various publications and most of them were better developed. My cousin brought me an Italian sewing /quilt magazine and helped me translate some of it to English. I loved the pictures and the magazine is very stylized more like a coffee table book. It was heavy into quilts using trapunto done in silks and satins. I put the Italian away on my reference shelf as it reminds me of my mother and grandmother. American Patchwork and Quilting use to be my favorite quilting magazine along with McCalls and I still love their special issues. Somewhere along the way I stopped liking them and dropped my subscriptions in 2011- 2012. Lately I have been picking them up again when I go to the quilt shop. I think the problem was that McCall’s and Patchwork both went to the dark side and had to many what I called MASHED up quilts where a single collection was used in the making of the quilt and it lacked contrast and spark. The special issues American, and Scrap Quilts did not have that problem but the flag ship magazine not only had lack luster fabric picks the pattern used where reparative. I once counted 4 monkey wrench patterns in the same magazine… boring. (I base all of what I am saying in one of my purges I only saved one or two patterns from an entire magazine. ) I am reconsidering my evaluation of these magazines because in the last couple of months I am finding them more diverse in their color selections, techniques used and block patterns. I have been reading some information on techniques I have never done so I am learning a lot. Too bad, I have become a PINTEREST fanatic and use that as my main source of inspiration. I now like developing my own designs rather than using patterns by other people. I guess I have changed a lot in the last couple of years as a quilter. This is all for now. I will be reviewing more books and magazines in the future. I just got saw some that I really want to look into. I also plan a big purge of 2 bins filled with older quilt magazine and that means I will have more opinions. This was another book I was given, but I really enjoyed it. The blocks in this book are traditional vintage blocks. Most of the blocks are identified by BARBARA BRACKMAN’s book ENCYCLOPEDIA OF PIECED QUILT PATTERNS. I really appreciated the identification of the blocks used. One of my biggest complaints about the recent quilt books and magazines I have read is that traditional blocks are used and the names are changed. I personally think this is disrespectful to the quilters who came before us. I think we should all be encouraging the book and magazine editors to insist on identification of traditional vintage blocks in their quilts. If a quilter wants to rename a quilt that is one thing but to rename blocks is an entirely different matter. This book included historical mini lessons for each quilt / block presented. I found the factoids interesting and informative, I really enjoyed reading them. In some ways this made the book for me. Another section in the book discusses colorways and even though they are not my colors I found the way they used colors was interesting. Many of the quilts had different setting not seen or used in traditional quilts. I also like the fact that most of the blocks are not run of the mill blocks so over published OHIO STARS, MONKEY WRENCHES or Drunkards Path. I have EQ7s BLOCK BASE, Barbara Brackman’s and Jenny Beyer’s block books and all of these blocks are in there. What I liked best was these required increasing skill. The blocks start out simple and become more advanced as the book progresses. Most of the quilts had interesting modern settings and colorways. I have taken many sampler quilts and found them a good learning experience that improves your quilting skills. I also found a lot of FREE MOTION QUILTING exhibited in the quilts. The FMQ went from simplistic to very intricate, giving me a lot of ideas for the quilts I am currently working on. All and all I am giving this a 4 out of 5 ratings ( GOOD READS) as I think a lot of quilters will find this a good book to use, regardless if you are a modern or a traditional quilter. I think you will love the blocks in this book. I also rated this high because of the historical factoids in the book. I will review the book again after I have made some of the blocks…. I feel another sampler quilt coming my way. 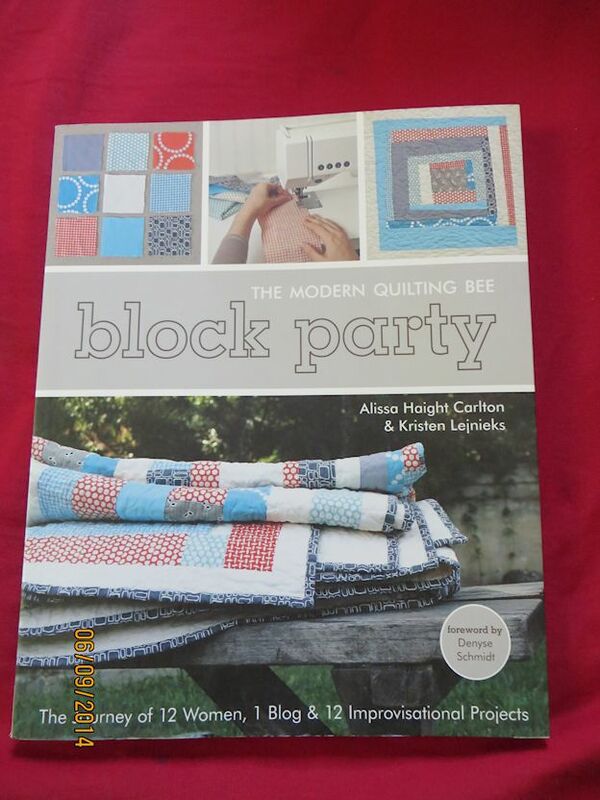 This book is different in that it was more of a chronicle of an on line QUILTING BLOCK PARTY ( BEE.) The book discusses a yearlong project among friends. They each took turns designing quilt blocks and sending instructions and fabric to the others in the group. Once the blocks were made they sent them back to the originator who assembled them into a quilt. Today, I recognize most of the names of the quilters who made the blocks, but if I had read the book in 2011 I would not have recognized any of the quilters. I knew little or nothing about the Modern Quilt Movement. I probably would have rated it very low as I had little or no appreciation of modern quilts and what they were about. I will also be the first to admit that I am rather HIDE BOUND and ridged in some of my opinions. I do not think I would liked many of the blocks / quilts in the book. I have learned a lot about the MODERN QUILT MOVEMENT and what they are trying to accomplish. I have a growing appreciation of MODERN QUILTS and have even made several blocks and quilts using patterns that are considered modern. 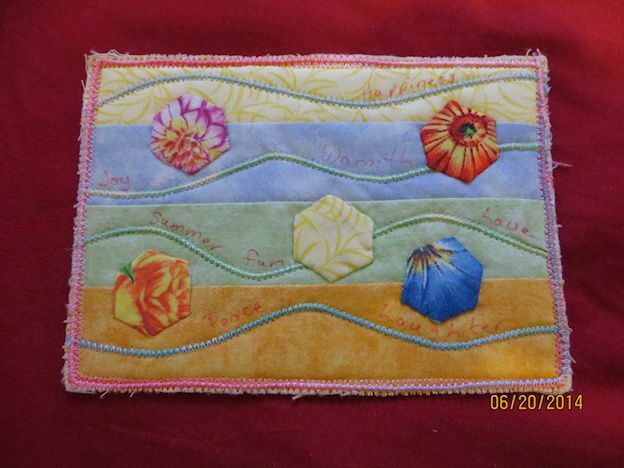 I enjoyed the quilters statements that are include with each of the monthly projects. They each discussed what they learned through the projects / quilt party and how it impacted their quilting lives . There were no real patterns supplied for the quilt blocks, more general directions and instructions. Since most modern quilters feel you should express your own creativity they give you enough instructions to make similar quilts but no real details. The book includes a chapter called, COLLECTIVE WISDOM. In this chapter they go thru general instructions for making a quilt including fabric selection, batting, quilt backings, general block construction and binding application, among other lessons. BECAUSE there was a lack of detailed block construction I would only recommend this book to quilters with some experience who want to dive into modern style quilting. I really liked some of the quilts but others left me cold. I think some of the issues I had with the quilts were the background fabrics and the colors selected. I am sure you will remember I dislike complementary colorways as I find them garish, so if the quilts were strongly complementary I tended to dislike it… but colorways are personal preferences. I also find that I do not care for most grey backgrounds as I think they muddy the other colors. That is another matter for personal preference. I might like grey better in the future as I have just painted the majority of the shared areas ( landing, hallways and computer room) of the house a pale blue grey. I rated this book a 3.4 out of 5 ( GOOD READS) as I enjoyed the quilter narratives and some of the quilts were interesting, all of them were creative and innovative. I decreased the rating and would only recommend this book to experienced quilters who have some understanding of how to construct blocks. As I have stated there are no detailed directions for block construction in this book. BOOK REVIEWs: MY reasons for doing them …. I do some web work on the side for a friend who opened a quilt shop in south east MICHIGAN. It is a pretty much one woman shop and she runs out of time to do the niceties of advertising and posting on her blog, so I have been helping her out by posting her sales and writing blog posts for her. I do a very simple blog and email advertisement send out for her customers. We do most of the work over the phone as her shop is 70 miles away from my home and I do not get out there as often as I would like. This weekend I went to visit her and her husband and the next few blog posts will be about some of the books and magazines I recently picked up. She can not afford to pay me in cash since she makes just enough to pay her bills, cover over head and a small salary for herself. So we came up with a wonderful payment plan…. fabric, thread, quilt books and quilt magazines ( those that do not sell) and various sundry items that I use in my projects. As far as I am concerned I am making out like a bandit since I rarely spend more than 6 hours in a week doing these tasks. In these book reviews I try to be unbiased ( something hard to do) and give a factual review of the book’s content. I try to think of all quilters and what they need. Sometimes my prejudices seeps through by the choice of adverbs and adjectives I use. I do review books that I purchase (or am given) that I do not like. I have very particular and marked tastes and I try not to let me influence my reviews. WITH that said I try to evaluate the directions and instructions given in the books, magazines and articles for their ease of understanding. I do not mince words if they are unclear or difficult to understand as I feel that is why I or other quilters buy a book. Yes, we are influenced by the ascetics in the books and magazines but if the directions are garbled I feel I have wasted my money and that make me very unhappy. I am going to ask you, my readers, would you rather have only positive reviews or do you also want the ones that are somewhat negative in nature EVEN if they are just my opinions.